After about 6 months from your delivery, when one is getting settled to all the new around her such as her new baby, her new sleeping pattern, her eating habits comes a phase when she has to get back to being her old self by merging the new with the old. Some women have this smooth transition while some others feel like they?ve got to solve some crazy puzzle. The challenging part of this merging is when the new mother has to continue nursing her baby while getting on to her old job. Around the world, maternity leaves are given only for a limited period and new mothers who get onto their jobs post the maternity leave have serious issues in continuing to breast feed their little ones. This is why we are going to give you some easy tips and some sensible tricks to ensure that you continue to nurse your baby while also adorning your role at office. One has to know about their work culture. Some offices have cr?ches where new mothers can take breaks to nurse their young ones. This is usually the best option. If your office does not encourage having your baby around, then the only option you are left with is to pump milk and store it. How many times one has to pump depends on the baby?s age (in months) and the mother?s breast milk supply. For women with heavy flow of milk, breast milk has to be pumped a minimum of twice while at work and several times during the entire day as well. Make a study of your work place to know if you can store the pumped milk without being noticed. Assessment should also include if the stored milk will be left without being bothered by co-workers. Make informed decisions by explaining the importance of breast feeding to your boss and taking his/her permission to extract and store milk in your office. Decide on who is going to be with your baby while you are working. It could be your parents or in laws or someone at the day care centre. Whoever is going to be the care taker, the common fact is they are strangers when it comes to knowing your baby?s needs as much as you do. Hence it is very important to educate them on picking signals from your baby when it is hungry and needs to be fed. It is also important to tell them how to re-heat the stored milk, how much warmth in the milk is required, whether bottling is required or not and so on. It is important to understand that breast milk has a certain warmth and is not expected to be hot. Also breast milk should not be heated directly in a boiler. Breast milk has to be re-heated in a double boiler and not in a microwave oven. If the breast milk is frozen, the double boiler should be used only long enough for the milk to turn liquid and not till it boiled. Inspite of all this, the baby will still feel reluctant to feed on this milk knowing the absence of its mother from the smell. Hence it is better to cover the bottle with the mom?s recently used clothes and feed the baby. Just a little trick. Pumped milk has to be stored in a deep freezer. It is important to mark the date and time on the storage container in order to use it in chronological order. Please instruct the care taker to use the oldest stored milk as breast milk can be stored for longer periods when stored in a deep freezer. For a mother with heavy flow, pumping milk can be very important for the absence of it may only reduce the milk supply and end up forming painful milk lumps. 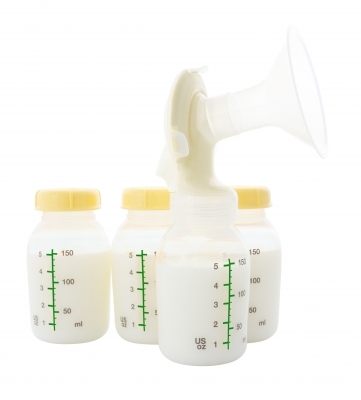 For about 6 months, your baby needs just breast milk and post that one can slowly introduce solids. By that time you can slowly wean your baby to just night feeds or whenever you are around. This can be quite challenging but not impossible.